How Does the New Heaven 17 BSOG Compare To My Attempt? 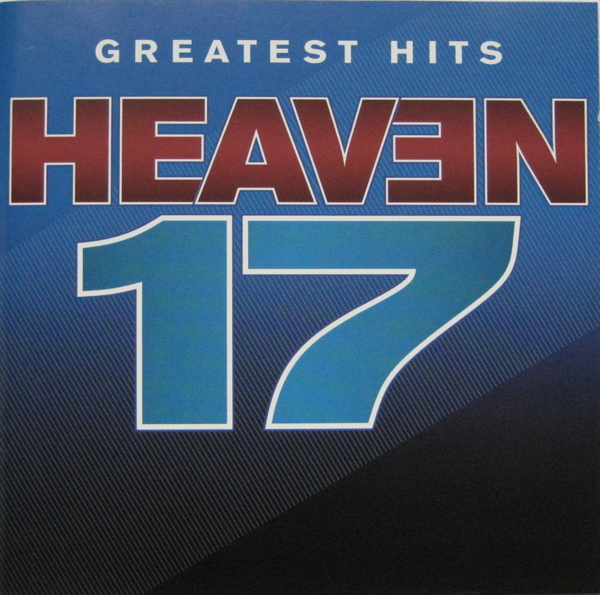 Finally, someone got off of their keister and compiled an actual Heaven 17 BSOG! Heaven 17 fans have been abuzz in the period where the blog was inactive lately! But that didn’t stop the world from spinning or the comments to pile up elsewhere. But it’s true! 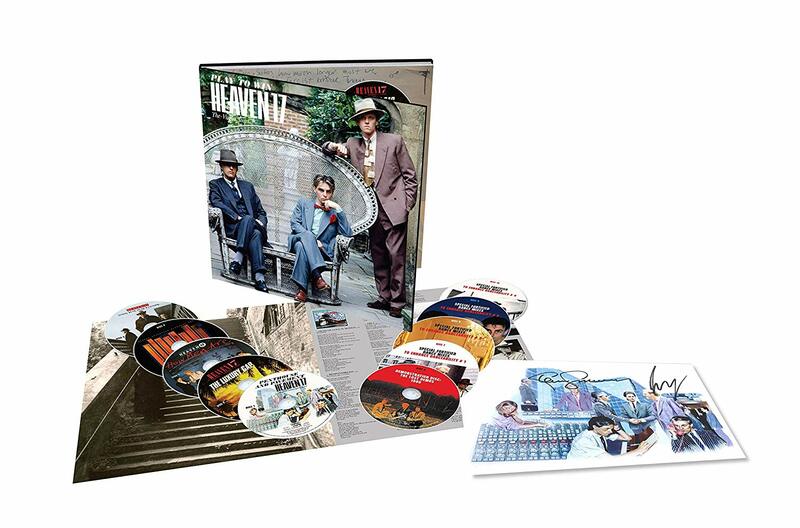 Demon Records Group are releasing a 10xCD Heaven 17 BSOG with a prodigious amount of compiled rarities. One of the things I really respect about this was that they went for maximum saturation. None of this “keep the sacred album intact” and lose 35 minutes that could be filled with rare remixes! We prefer density of content to polite sprawling and worse, lost content because the space after the album was being wasted. On March, 29th – the same day that the Simple Minds “Regeneration 2001-2014” box is released, my money will be being set aside for this product instead. The ten discs are jam packed with rarities as we will see below. The format is a 12″ x12″ box complete with large format 36 page book of liner notes and ephemera. As close as we’ll get to that H17 coffee table book, I’m afraid. The ten CDs comprise all of their Virgin Records releases, so nothing will be included from later than the early 90s era of post-modern mixes that saw “Temptation” actually improved and hit the UK top five for the second time in a decade. What’s in store for us? All of that is going for £89 [$114.69] in pre-order with amazon UK offering a signed edition [no word on how many copies available] for buyers who have to have it on day one. Since I already have Martyn Ware’s autograph, I’ll be likely to pick this up once it “hits the market” at what I’m betting will be less that three figures, if I time my purchase right. But with these BSOG’s, one cannot be lax. They all seem to accrue in market value so dawdling is not an option. So yeah, I’m pre-sold in buying this; whether its perfect or only near perfect. I’ve made my own box for this band in 2006 and I even remastered and re-compiled a 2nd edition in 2009! 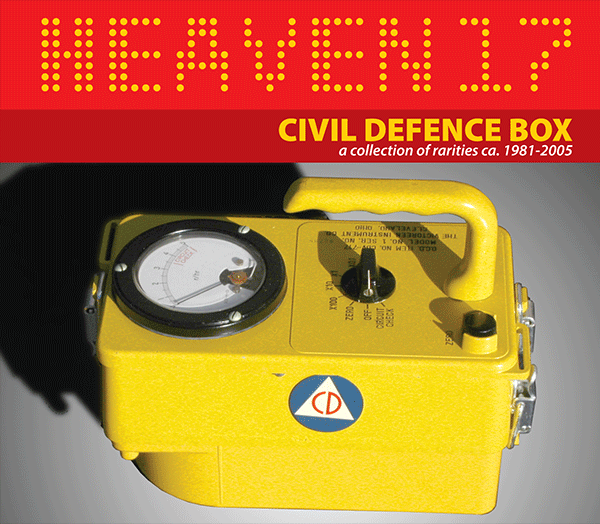 So yeah, I’m serious about my Heaven 17! I opted to include the Glenn Gregory vocal turns from the first B.E.F. album. Sure, they’re covers, but they have every member of H17 on them. And they’re great covers. I also added the Glenn/Claudia single sides for ZTT… because I could! They included two mixes from the “Endless” compilation. I used Potoker’s remix of “Penthouse + Pavement,” but skipped on “Let Me Go,” which simply has a different sampled vocal intro… maybe all of 10 seconds longer. I never had the “Endless” cassette version, where the “Play To Win” version resided, so that’s nifty. Their lack of “Chase Runner” from the :”Electric Dreams” OST and especially the specially fortified dance mix of “Are Everything” are problematic. On the other hand, they have the “Crushed By The Wheels Of Industry” [dub mix]” which I have on USP 12″ but I swear that there’s nothing unique about it. Was I wrong not to include it? Finally, they have all of the 1992-1993 post-modern remixes from the “Higher + Higher” greatest hits era that saw “Temptation” so dramatically reconfigured. I only have a few of these, and all of disc 10 is material that I have yet to track down in any other form. That gives this set a full 28 tracks that I did not include in my effort, which was undertaken twice knowing that it was incomplete both times. Sometimes I wait for a decade or more to source a scant few tracks. Some times I throw caution to the wind and go for it anyway. Knowing full well that it’s possible to think one has a “complete collection” only to find out the bitter truth years later. We’re not getting any younger, so I tend to be finally moving in the more pragmatic direction. And I’ll be moving to buy one of these bad boys sometime this year. I’ve seen these mondo BSOG projects for Erasure and Dead Or Alive and while I could cheer from the sidelines, I do not need that much of those bands. Not so for Heaven 17. I have always loved their political electric funk and the fact that they reformed in 1997 and have been fairly active [though not as active as I’d prefer…] since then has meant that as a still active band that I collect, their value has kept rising in my esteem. This entry was posted in BSOG, Core Collection, Want List and tagged 2019, BSOG, Demon Records, Heaven 17. Bookmark the permalink. 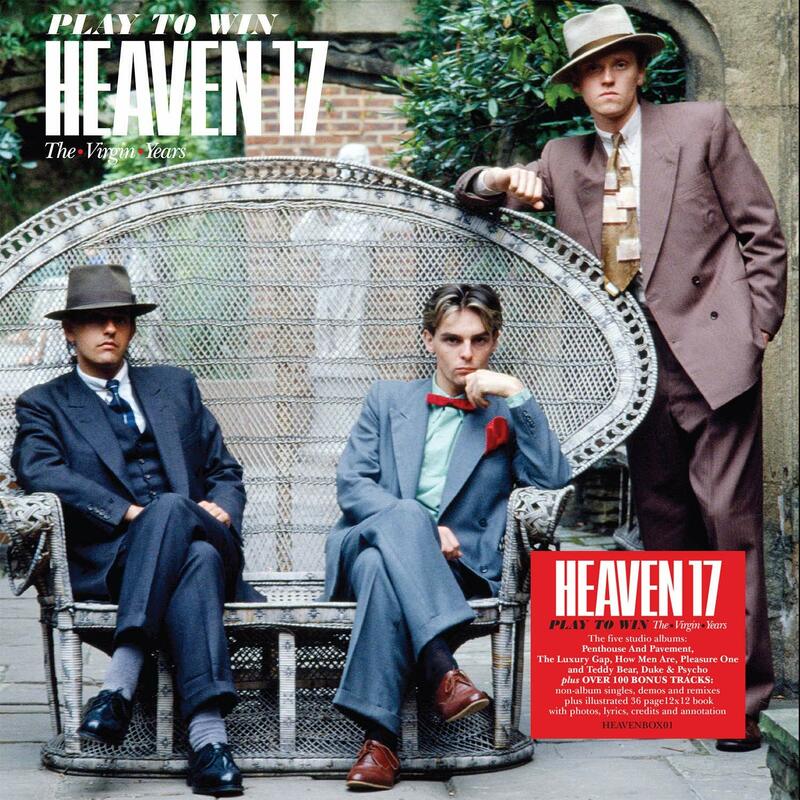 21 Responses to How Does the New Heaven 17 BSOG Compare To My Attempt? Let’s hope the mastering on this one isn’t botched. Seems to almost be the rule rather than the exception these days. Looks like you can distill your own collection down to two discs now, eh? Or one disc if some of those later remixes are left off… are they any good (the ones on disc 6 of your box)? JT – Well Demon sure screwed the pooch on the 19xCD Dead Or Alive “Sophisticated Boom Box!” There were so many errors on that that the mind positively boggled. To say nothing of the caliber of the mastering. I will say that the “New Gold Dream [81,82,83,84]” SDE I’m currently listening to is well mastered, though I would like to get a copy of the SACD version to hear the DSD mastering. I’ve been very impressed with A/B comparisons of material I have that’s mastered DSD versus other paradigms. Maybe my H17 will be a supplement to the new stuff with the details left out and the post-Virgin era. I remember liking most of the mixes from “Bigger Than America” though they were 90s mixes. I don’t have any of the huge dump of remixes [of just 2 songs!] that were commissioned for their “Before/After” album by Ninthwave, their US label. I didn’t care too much for “Before/After.” The only thing political about it was Malcolm Garret’s cover! dhrichards – Oh yeah, that’s right! You run Ninthwave, don’t you? So the reason why “Hands Up To Heaven” and “Gonna Make You Fall In Love With Me” were remixed to the ends of the earth was that you only had track masters for those two? Well, that’s very… practical! At least those mixes charted! I thought that “Before/After” was a dynamic dance record full of hooks that completely passed on any pointed political content. I was expecting more than “relationship songs” in the middle of what was then a political dumpster fire of 2005. Of course, we look back at that gentler time with rose-colored glasses now! What I’ve heard from the possibly never arriving next album was much more in line with my hopes for Heaven 17 songs. “ran” ninthwave. no longer my baby. It was a good pop album, but yeah, not the wdge if the previous stuff. I feel like the H17 well has been tapped dry already. There are endless (see what I did there) compilations, remastered deluxe editions, etc. I’ve got most of them! Can’t see my way to this box, nice as it looks. In any event, the quality of the material dropped off rather precipitously after Luxury Gap. How Men Are is about half of a good album, the others after much less. So that’s a whole lot of box full of stuff I don’t care about. I ordered this box as soon as I heard about it. Shame about the We Live So Fast US 7” version missing and a few other tracks that I feel deserve a spot more than the mixes from the early 90’s. To be honest I got off the Heaven 17 train after How Men Are. I heard a few singles off the next two albums but wasn’t particularly impressed and so never bothered getting the albums. So it will be interesting hearing these two albums for the first time thirty plus years after release! I also started ignoring Heaven 17 after “How Men Are,” but much like Eurythmics with Savage, when “Bigger Than America” was released I was very pleasantly surprised. I love it and still listen to it often. Monk – I also had mixed feelings about How Men Are. Some good tracks, some very average. I didn’t particularly like the overreliance on the Fairlight. There doesn’t sound like there’s enough depth of sound on many of the tracks to me. I only heard Train Of Love In Motion once when the band ‘performed’ it on some kids’ Saturday morning TV show, in the UK, at the time of it’s release. It didn’t grab me at the time. Maybe with a few listens I might feel differently. Gary Numan’s Outland!! That’s one poor album. And not his only one from the late 80’s/early 90’s. AndyB – Yep. You hit the nail on the head with the Fairlight. They used it for good seasoning on “Luxury Gap” but they went overboard on “How Men Are.” The songwriting is nowhere near as good. I blame the Fairlight… and cocaine! “Outland” was the Numan album I could find almost no merit in. I like the brief instrumental interludes. I still have a copy of “Warriors” and “Machine + Soul” since they are part of boxed Numan sets, so I can’t divest myself of them so easily. Even so, they are measurably better. Gary Numan: I was quite the Numanoid, and liked much of “Berserker” and “Strange Charm.” But after those, he lost me. Ultimately I think what you’ve made already is better. I understand the bug that says get it all, it’s up to buyers like yourself to decide if the quantity of “I don’t have’’ on a release like this is worth that cost. You’ve already done an admirable and remarkable job on your home made version. I much prefer something like the Lee Hazlewood Industries set, while not being a comprehensive career collection (it focuses on one label that his work was on) the set has a stunning hardbound book. A bit too much frou frou in the book (plane ticket reproductions, really?) but if you’re going to sell me anything other than music with this I want a book of this quality. A quibble with your post….including the Erasure set isn’t really apples-to-apples in comparison. It’s really a huge singles set with some curated discs by the core members of the band. Sets by acts like Heaven 17, Dead or Alive, etc that we’re talking about here are whole albums with additional b-sides and mixes. That’s a world of difference when it comes to content. Actually buying that Erasure set to me is a real headscratcher, one probably has most of this already and if you don’t and this is your point of entry…..???? It’s like saying, well I like their music so much I’m going to drop $100 on a box set but ha ha, you know I’ve never bought anything by them before…..funny that. For a band I love to excess, I have never felt the need to have every demo and every slightly different mix. I am a flag waver for both How Men Are – one of my favorite Fairlight albums and Pleasure One – Where H17 strive for Parisian sophistication and find some wonderful sounds on that journey. This may get me in some “trouble” – that one was for you Monk, but I think of Pleasure One as the album Spandau Ballet could have made after Parade, avoiding the ill fated Barricades. It’s an easy, urbane album of Pop. 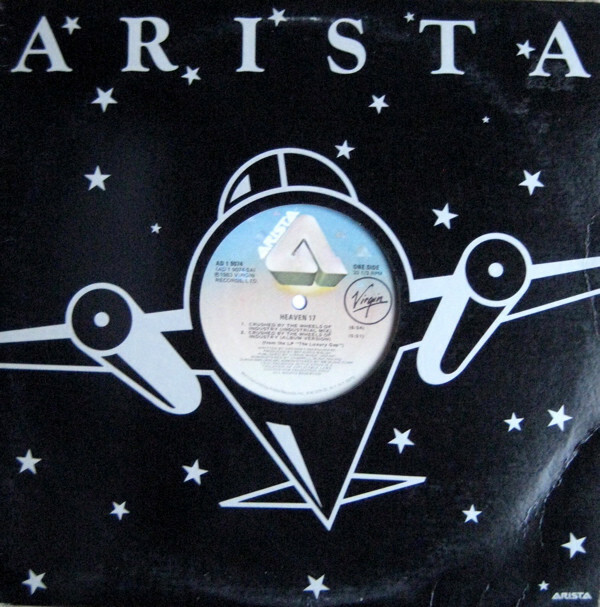 For me I would like to have seen some sort of reproduction of the Arista US debut- the songs are all there some place, but for me that will always be the “best” Heaven 17 album, mainly because it is the first thing I heard by them. dhrichards – One man’s meat is another’s tofu, I guess. For a long time “Teddybear” was my 3rd favorite H17 album. It’s “Pleasure One” that left no impression at all on me. 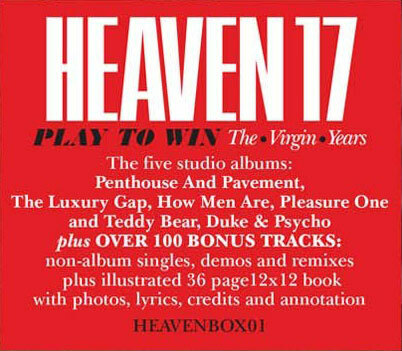 I’m surprised that some low key reissue label out there hasn’t made a move on the “Heaven 17 ” compilation yet. Doesn’t that seem like a natural for Wounded Bird? I don’t know how they continue to eke out releases, but they seem to do it. After Let Me Go 12” I lost interest. These box sets that now include demos seems to be the new thing. Much like the New Order Movement box. Of interest to true fans I guess. I always thought demos were left off because that is what a demo is. Price seems fair. Wonder how much H17 see of this since it’s all Virgin. Of interest is a cover version of H17 Facist Groove by LCD Soundsystem that just came out. “Train” is actually one of my absolute favourite* H17 tracks. I’ve enjoyed much of what they’ve put out fairly uncritically over the years, though I acknowledge the “Fairlight slump” that hit a lot of bands hard at that time. Like many of those bands, there were too many remixes that weren’t different enough, but when you have songs as good as most of their hits at least the base music bed for them is worthwhile. Demos can sometimes be interesting because they can show the development of the final song, and of course sometimes the demo caused a radical rethink of the whole song core to what we ended up with, so for the most part I enjoy demos. The main thing I’m disappointed in with this new set is that a) the band didn’t check with the Monk first to see what they might have overlooked, b) probably at least one disc too many of “fortified” material, and c) that printed supplement is way too short. Well, thanks for that article. It lead me to returning to H17 and buying some missing stuff right ahead (like the ‘Let Me Go’ Remixes on the 1992 US ‘Temptation’ Release) and I even try to get some understanding for the turn they took with Teddy Bear (…) once again. What I’d really like to know is why they dropped the BEF Production Moniker for ‘Pleasure One’ and it’s follow up. I still recall they even announced a ‘Pleasure Two’ Album in an interview around that time to follow shortly because they had such a ‘creative flow going’ but nothing ever turned up. Well anyway, at least ‘Contenders’ and ‘Trouble’ were great singles back then.